A stop at a restaurant can just be an opportunity to refuel for more exploring, but there are those times when it turns into something special. 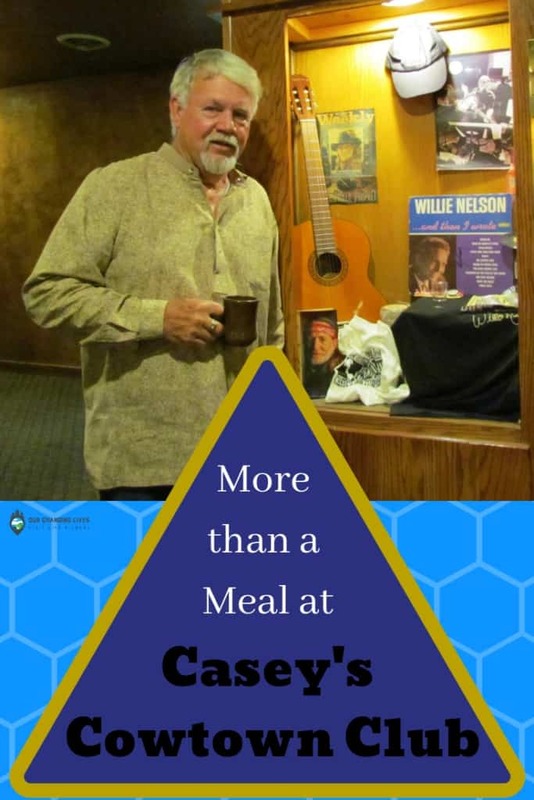 Our visit to Casey’s Cowtown Club, in Dodge City, Kansas was one of those special occasions. From the outside it looks like a restaurant one might find along Route 66, but the exterior hides the fascinating interior. While Casey’s is known as a steakhouse, (This is the cattle capital, after all!) we dropped in for their breakfast, which was highly rated. We want to thank the Dodge City CVB and Casey’s Cowtown for their hospitality. Rest assured that all opinions are our own. Stepping through the front door we were greeted by an unexpected view. 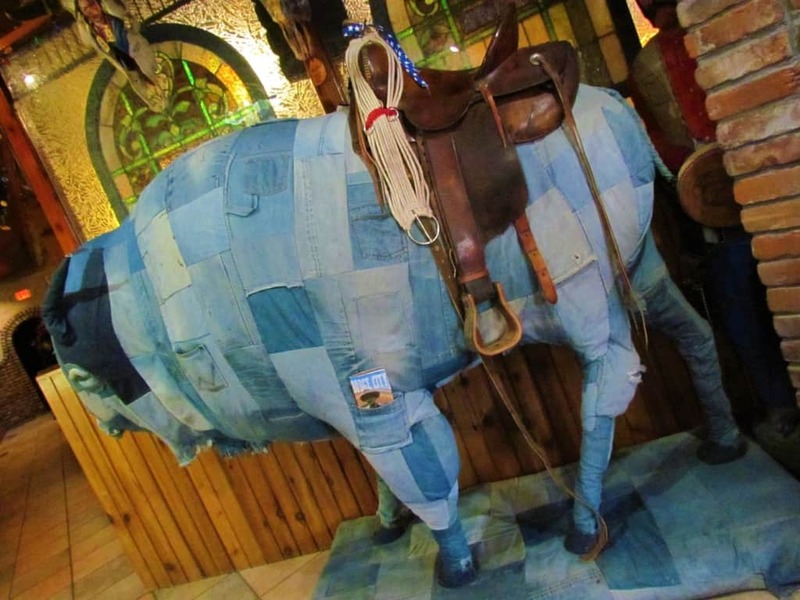 Dodge City is clearly a town you would expect to find western motifs, but a blue jean covered bison caught us off guard. It set the tone for what would be one of the most interesting restaurant visits we have had. The hostess welcomed us and led us into one of the many dining rooms located inside the building. Once again, we realized the exterior understated the massive spread that this place covers. Later we would discover even more about that subject. Once we were seated, we had a better chance to scope out our surroundings. The more we craned our necks, the more we discovered. The walls seemed to be almost completely covered with unique artwork. Here and there were displays of beautiful stained glass that glowed in the morning light. The realization that this establishment has some years under its belt became quite apparent. 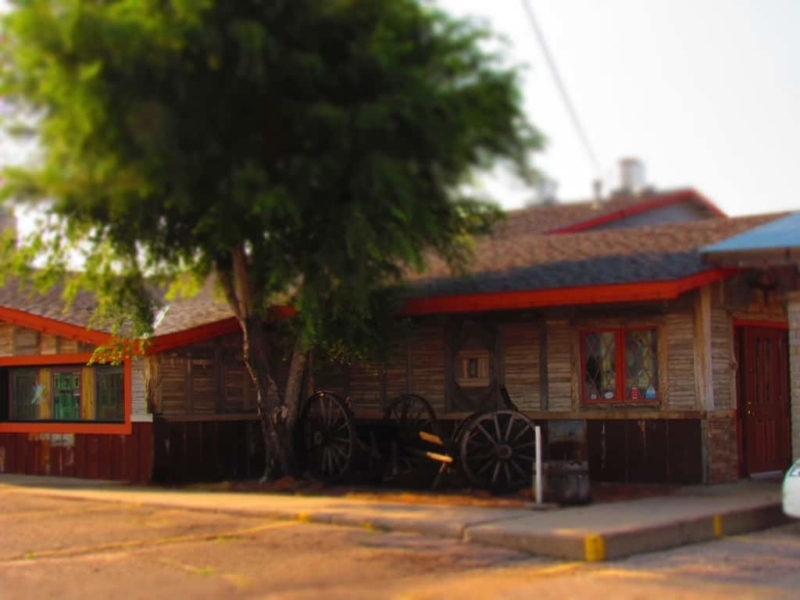 Little did we know the depth of history associated with Casey’s Cowtown Club. This too would change! Our server brought us two cups of liquid gold, (Coffee, y’all!) while we scanned the menu. 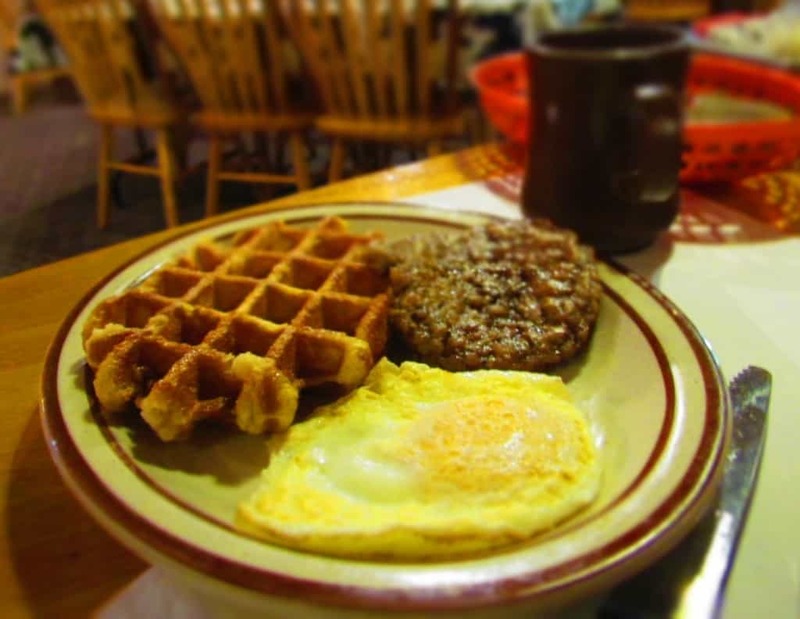 Casey’s has your standard breakfast offerings, which provide all of the needs for our upcoming morning of discovery. After placing our orders, we were joined by Mike Casey, the owner of the restaurant. I had spoken previously with Mike (by phone) and had hoped we would have a chance for a face-to-face. When we were seated, he was busy chatting with some of the other customers, who were obviously locals. As a matter of fact, it seemed like we were one of the few in the place that weren’t from the surrounding region. Mike sat down and we began talking like long lost friends. Mike ordered himself a plate and soon we were all dining and discussing the history of Dodge City. We learned more at this morning meal than in all of the time I spent researching our visit. Mike invited me to test out his restaurant’s specialty, and soon a hot plate of calf fries were perched in front of me. Once again Crystal declined the chance, but I found these to be some of the best I have sampled. 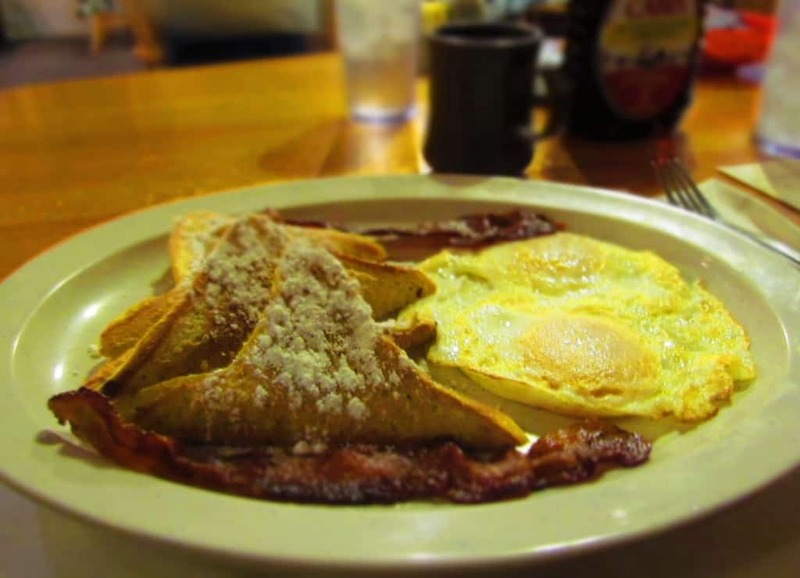 With freshly filled cups of coffee in hand, Mike invited us on a tour of his restaurant. As we passed from room to room, we found two common themes. First, everyone knew and greeted Mike, and he returned their greetings with down home gratitude. Secondly, Mike was proud of the massive collection of art and memorabilia he has amassed. We can completely understand his pride, as so many of the pieces clearly hold fond memories. As we moved through the building, it just seemed to keep going and going. Everywhere we passed was filled with amazing pieces of art, as well as tons of stained glass. He told us how he loves to rescue these pieces when he finds that they are threatened with destruction. 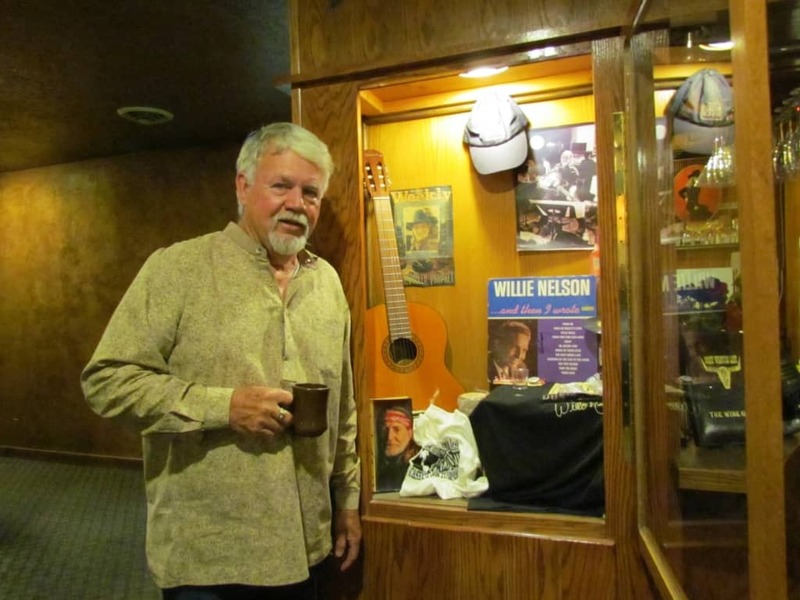 What may look like an eclectic collection to some is truly a labor of love for Mike Casey. This is certainly a place you need to see when you visit Dodge City. Just be sure to ask for Mike when you drop in. He just might take you on a tour!